2 Months Down…10 to Go!!! I am the sole member of my entire family that roots for the University of Michigan. Granted, I grew up in northwest Ohio, but my home was closer to Ann Arbor than Columbus, so cut me some slack. Doc blames my father (his oldest brother) for failing to raise me up as a Buckeye fan. Either way, here we are in 2013, and I am still a diehard Michigan fan. Michigan Vs. Ohio State football is arguably the best rivalry in sports. Check that! It IS the best rivalry in sports. It was late in January that I made the comment to Doc that we should put something on the line here with his weight-loss goal. I made the comment that he should have to get all decked out in Michigan gear if he doesn’t reach his goal. He agreed, as long as I would do the same with OSU gear if he did reach his goal. Then, he took it a step further, and said that the loser would have to wear the “enemy’s” clothes AT THE BIG GAME! After the shock wore off of actually being able to attend my first college football game either way, I then realized that I was much more at risk if I lost. The game is at the BIG HOUSE this year, which means I would have to wear OSU gear; sticking out like a sore thumb, and Doc would get to blend in with all of the other Michigan fans. Either way, we both agreed on the stakes, and it’s settled! So, here’s hoping that he gets within 1 pound of his goal without reaching it 🙂 So,how is he doing? 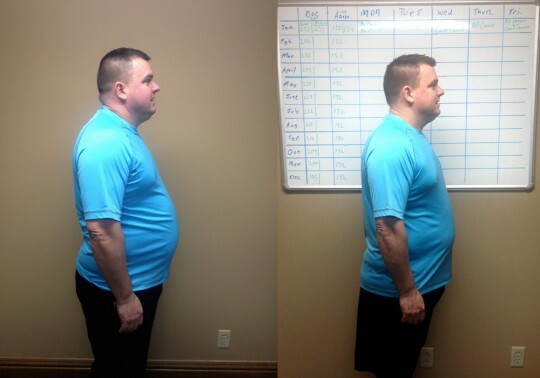 I informed you last month that Dr. Waggoner has set a goal to lose 90 pounds in 2013. He got off to a great start in January by losing 15 pounds! We set a goal of losing 11 pounds in February, and he did just that! 259 pounds after two months. There is a long journey ahead, but as you can see in this photo, he is already starting to look noticeably thinner. Keep it up Doc! Next month…10 more pounds! Very proud of Aaron to stay committed to Michigan even though his family is loyal to the Ohio Buckeyes. I agree with you, Aaron, that I hope Terry gets within one pound of his goal. That will make your celebration of a Michigan victory next November even more enjoyable. Go Blue!